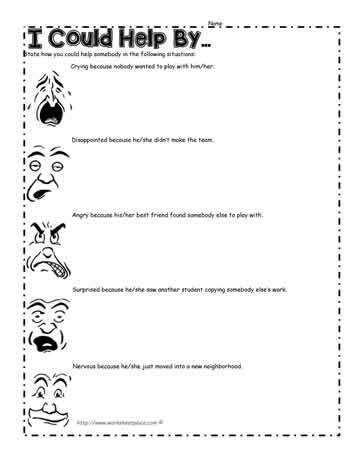 Feelings and emotions worksheet. Analyze the emotions from the faces and show how you could respond to assist a person that may be feeling this way. Reading facial expressions is another important social skill. Before giving this worksheet, use different feeling words and ask students to make a facial expression and show body language according to the feeling word. For instance: ask them to show you what their face looks like when they are angry and what might their body language be. Practice a variety of feeling words before giving the feelings and emotion worksheets.